One of a select group of indigenous champions to have graced the football fields of Tasmania, Des James was a classy and dashing back pocket player who enjoyed a highly distinguished career both at club and representative level during the last decade of the pre-Statewide League era. A member of the Yorta Yorta aboriginal people, James was born and raised in Shepparton in northern Victoria, and began his football career with the Lemnos-Shepparton Football Club in the Goulburn Valley Football League. A prolific talent from an early age, he won the GVFL Thirds Best & Fairest award aged 17 in 1969, and three years later finished third in the senior award despite missing seven games. In 1973, James spent a season playing in Sydney with Newtown, who were coached by former Sandy Bay champion Gordon Bowman, and it was on the recommendation of Bowman that James – who had returned to Victoria at the end of the season – was approached by Sandy Bay secretary Michael Wright about potentially joining the club. James agreed to a trial, and after impressing in a pre-season practice match he officially joined Sandy Bay for the 1974 season. James joined Sandy Bay at an interesting time: the club was coming off a shock loss to Hobart in the 1973 Grand Final after going into the match undefeated, and it was hoped that the addition of James and former Melbourne defender Noel Leary would give the Seagulls’ defence a much-needed boost. After further Grand Final losses in 1974-75, James and the Seagulls finally broke through for a premiership in 1976 with a crushing 96-point win over Glenorchy before going on to take home a hat-trick of flags from 1976-78. During this period James had developed into a brilliantly effective rebounding defender, and the sight of James’ bouffant hair, prominent moustache and speedy dashes out of defence became a regular sight in the TFL football of the late 1970s. He had also transferred his skills to representative football, regularly featuring in TANFL intrastate teams, winning the Weller Arnold Medal as the league’s best representative player in 1977. Sandy Bay’s golden era came to an end after the 1978 premiership, however James continued to star for the Seagulls for many years. In 1979 he was chosen to represent his adopted state at the State of Origin Carnival in Perth and, in an incredible achievement, he was the only TANFL-listed player to be selected in the All-Australian team at tournament’s end (fellow Tasmanians Darryl Sutton and Michael Roach were also selected but were playing in the VFL at the time.) Back at home James was appointed Sandy Bay captain in 1983 and would hold the role for two years until, after 11 seasons and 209 games in the blue and white, he departed the club, moving to Clarence for two seasons before retiring from senior football at the end of 1986. He left a legacy as not only one of the finest players in Sandy Bay’s history – a fact confirmed by his selection in the ‘Bay’s Best 25’ in 2001 – but also as possibly the greatest indigenous player to have played the game in Tasmania. 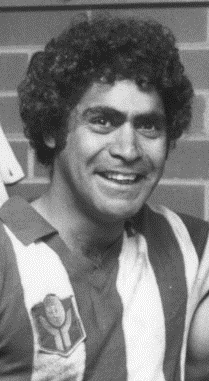 Arguably his greatest achievement however came in 2005 when, although not selected in the final team, he was short-listed for selection in the Indigenous Team of the Century – a team selected in part by his brother, celebrated VFL field umpire Glenn James – in effect recognising him as one of the 35 greatest Indigenous players of all time.